Created through high-speed mechanical agitation of water, the microbubbles contain a gas, oxygen, that will then be used to purify the contaminated water of lakes and dams. The small size of these bubbles (one micrometer) prevents the bubbles from floating to the surface at any rapid pace. In fact, the small buoyancy force acting on the bubbles is so small that the microbubbles are left submersed in the water for minutes or even hours. Another advantage with microbubbles is that a greater air-liquid interface surface area can be achieved for the same amount oxygen in larger bubbles. In short, the microbubble technique proves efficient for dissolving gas into water. Microbubble generator. Image courtesy of Dr. Shuya Yoshioka. 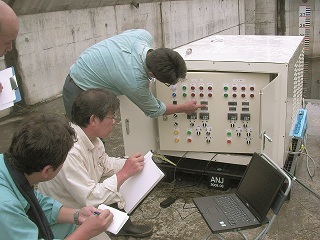 Dr. Shuya Yoshioka of Ritsumeikan University in Japan, tested his microbubbles with experiments at the Sounoseki Dam. In the article “Restoration of Lake Water Environments” in COMSOL News 2011, he explains that injecting oxygen microbubbles into lakes will both oxidize metals, causing them to precipitate, and stimulate microorganism activity to break down and eliminate organic material in the lakes. In the article, he states that “in these trials, it is necessary to predict all the environmental phenomena that might affect the body of water (wind, water flow, temperature, chemical reactions, and diffusion.” Because all of the equations governing these need to be solved simultaneously as opposed to sequentially, Dr. Yoshioka turned to COMSOL Multiphysics to find the most effective and cost-efficient way to inject the microbubbles. In simulating the water currents of the dam, the researcher discovered a large-scale recirculation region that he later took advantage of for seeding and diffusing the microbbubles throughout the whole dam. Using COMSOL Multiphysics and the CFD Module and Chemical Reaction Engineering Module, he was able to determine where to add the bubbles to the water, and at what depth and rate. Simulating microbubbles: mass diffusion over a cross-section of the Sounoseki Dam reservoir. Image courtesy of Dr. Shuya Yoshioka. After deploying his purification system, trial testing of toxin levels in the dam showed that the addition of oxygen microbubbles dramatically decreased the concentration of certain toxic substances (including nitrogen, phosphorus, iron, and manganese). 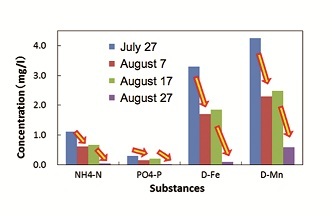 Trial testing results: concentrations of toxic substances reduced (note: the experiment was suspended during August 7-17). Image courtesy of Dr. Shuya Yoshioka.